One of the weirdest rites of passages to becoming an adult is tackling the holidays on your own, realizing that now it is your turn to decide how to celebrate and make the season bright for yourself. For a holiday like Thanksgiving, one that is known for feasting with friends and/or family, sometimes figuring out new traditions is even trickier, especially if you’re a bit of an introvert. When I first moved to New York City, I spent Thanksgiving with my family for the first couple of years, but I quickly started realizing that the expense of going home for a few days (or, in one case, for my family to come up to New York) was not worth paying holiday pricing for travel and battling to get the days off from working my retail side hustle. Staying in the city for Thanksgiving without any family nearby to celebrate with made me determined to figure out a way of spending the day in a way that allowed me some of the traditional experience without stressing too much about it. My retail job, in addition to my full-time office job, had me working seven days a week usually, so the rare holiday when the store was closed was certainly significant, especially with Black Friday and the very busy gifting season on the horizon. I did not want it to go to waste. While I occasionally had an invite from a friend to join their family for dinner, I often didn’t want to spend my day off as the stranger crashing someone else’s gathering. The idea of going to a friendsgiving could also be daunting, as I didn’t necessarily want to be social and make small talk with new people. I wanted the freedom to enjoy the Macy’s parade in my pajamas, not having to get dressed and ready to go out, and eat good food without sweating all day in the kitchen. Whether you host a Thanksgiving gathering or have it at a friend’s, see if the guest list works for you. Sometimes you don’t want to have to meet new people, making conversation with strangers who you may or may not see again. Or you don’t want to deal with the drama of a large party mixed with friends and acquaintances you may or may not like. That’s okay! Turn down invitations you aren’t feeling and instead surround yourself with only your best and closest– whether that’s a roommate, significant other, best friend, or even your cat. While the iconic image of a whole bird being carved by the head of the table may stir warm and fuzzy feelings in your soul, it’s not necessary to go whole hog — or, I guess whole turkey — when it comes to a smaller Thanksgiving. A turkey breast can be enough for 2-3 people and can still have that traditional taste. I remember I made a breast without a recipe my first solo Thanksgiving and copious amounts of butter made everything okay. You can also edit down your sides to just your favorites– no need to make rolls or a salad if that’s not what you’re hungry for. 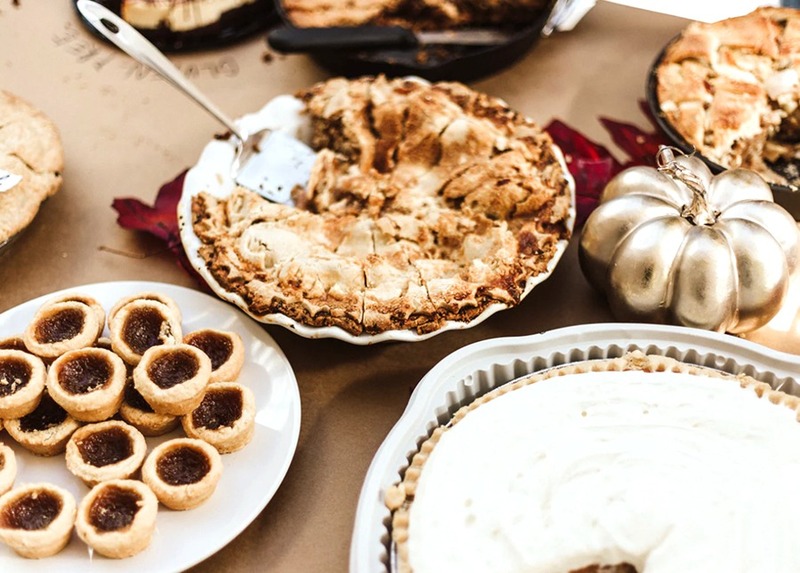 Thanksgiving can bring out the inner Martha Stewarts in people who love cooking, but for the average person, making a multi-dish meal can be daunting. Allow yourself to take whatever shortcuts you need. Will chopping vegetables be a total chore? Get pre-cut ones. Don’t have time to bake bread and make stuffing from scratch? Use a box mix and throw in some fresh veggies. Serve that gelatinous cranberry sauce over a fresh made one if you want! You’re not on Food Network! No judgments here! If you do have a guest or two coming over for Thanksgiving, ask for help in any way that will make your day easier. Ask them to each bring a side or a dessert. Don’t be afraid to ask them to bring last-minute essentials like ice or alcohol. Or ask them if they can help do dishes after the meal is over. The point of a small-scale celebration is to be in an environment of total comfort, so if you think people will balk at the idea of lending a hand, don’t invite them! More turkey for you. All of these tips involve a certain amount of cooking and hosting, but there’s also always another alternative: just have food ordered or catered. I have a couple of friends who had a tradition of ordering a Boston Market turkey plate for each of them on Thanksgiving, and they couldn’t have been happier. I almost always ended up cooking, but I had a secret fantasy of ordering in Chinese and eating it alone in my apartment while watching Netflix. There is no “right” way of celebrating Thanksgiving, so feel free to plan it around what you want and need. After all, if you find a nice way of enjoying the holiday without feeling left out, chances are you’ll feel like you have a lot to be thankful for.